the current default theme Barceloneta looks not good on album_view and also on summery_view, because of the images. It seems that the layout expects bigger images size in Barceloneta as 128x128. The styles are expecting 200x200 pixel images in album_view for example. But the scale "thumb" which is used in the templates is by default only 128x128px. I think the bigger size is better and more useful. But we need to fix the situation for the OOTB experience. We can either change the scaling of thumb to 200x200 and also increase the bigger scales. As the large is 768x768 which is by far larger these days. So this could be 1200x1200 for example and preview could be like 768x768px and mini 400x400 then. Another solution would be to change the templates, but we still would have only small scaling sizes and the side effect could even be bigger. So if we change the default scaling sizes in th next version and point the people to that change, it would be fine. And people can still change it to the older values if they want to work with the old values. Any opinions about the way to fix this and about the future scaling sizes? mini = 200x200 last I checked. Which is what you want. This would solve the problems with the current default theme Barceloneta expecting 200x200 images where thumb is used in templates and also give us bigger "large" scale for like zooming pictures. For backwards compatibility a new larger size sounds better to me. It seems easier to update some templates where thumbs should be larger then to have all website images double-sized during a CMS upgrade, which I think increases the risk of breaking custom themes and layouts. I agree with @davilima6. I'm always creating new sizes when required to fit a specific theme/layout. So updating the views @MrTango mentions to use bigger images would be the best approach I think. I think it's better to update the sizes to reflect the current needs. Adding more sizes can lead in more data and will confuse the users at the end. I don't think that we have a big problem on updating the sizes. We can make it clear that we use now more up to date sizes. So every old theme which really uses the old sizes, can easily reset them to the old values. And i think we shouldn't override the values on updates anyway, so only new created Plone sites would have the new values. I talked with @vangheem about this and he also likes the idea to update the sizes. I'd make the sizes visible in TinyMCE configurable and use something like "small, medium and large or even xlarge" for scales inside the editor and keep our technical scales out of the sight of a normal user. What about adding more sizes (larger and 'full width (= max width of content (useful for banners). And then just a setting in the registry (or a control panel entry) for what sizes to use for the different views ? I always have this (on a each content ) for news items (medialog.leadimagesize ... a bit beta since I override the templates with jbot in the themes now) and usually for summary view. i don't understand what do you mean with full with / max with of content as a size. Can you tell us what size that should be? I guess that size will be different in many themes, but this would be ok. I'm not sure if really need more sizes for this. I usually used preview for image with the width of the content column and large for zooming images. Making it configurable doesn't help here, we need sane defaults. The sizes by it self are already configurable, but they are meanwhile just to small for screen resolution we use nowadays. 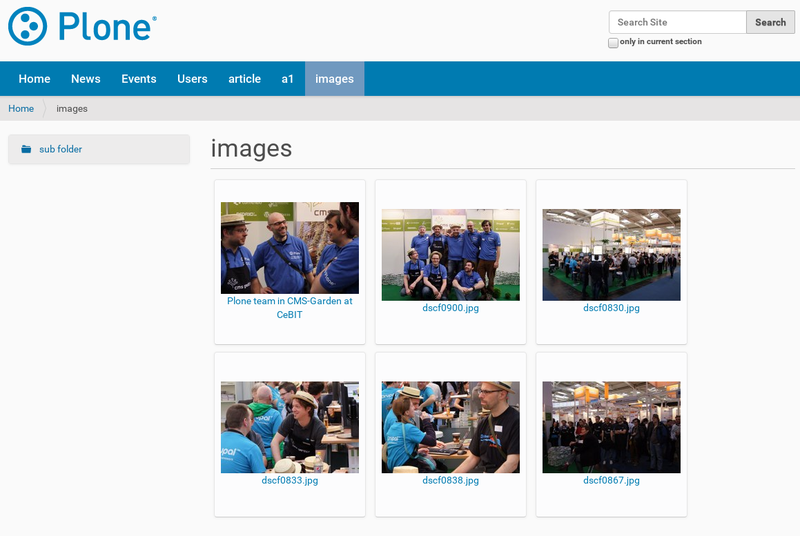 For the leadimage behavior your functionality is nice and should go into Plone core. 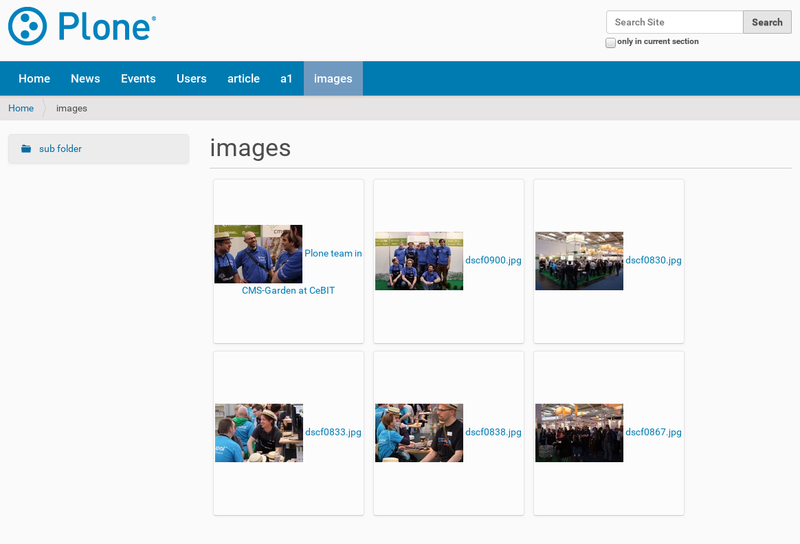 In my opinion we could get rid of listing 16:16 and tile 64:64, because i don't see where there are used in Plone 5. Icon 32:32 is used in the folder_contents and thumb in TinyMCE file browser. Or increase the size of listing to 32x32 and use it for folder_contents, what makes even more sense by the name . By 'full' width: I mean the default max width of barceloneta (1440px maybe). By 'configurable', I dont mean the sizes, I mean the views. PS: The navigation portlet also uses images if it is enabled..
We use the "Original" Value for Fullsize Images. A Diazo Rule for adding a css class "img-responsive",like Bootstrap it use, take the rest of Transform. But some Editors load hugh Images into Plone CMS, but this is Training Factor of these guys. OMG, Plone has for all Problems a Solution, Thanks!